Experiencing Life Through The Chakras provides an important roadmap through the chakra system for every soul desiring to awaken to their higher self and reach their full potential. The book explores the role the chakras play in how life is experienced-from the affect the chakras have on the decision making process to the success achieved in life. Simple and easy methods are given to work with the chakras to remove limiting patterns, thereby, opening life’s possibilities and freeing one to achieve one’s dreams. What the chakras are and how they have evolved for use in today’s world. Why the chakra system is key to opening the possibilities in you life. How each of the seven major chakras affects the physical and spiritual aspects of your life. Methods to remove blockages within the chakra system that can limit your life. Spiritual Principles that can enhance the abilities of the chakras, allowing you to express more of who you really are. The role of the chakras in manifesting your life’s desires. How the chakras affect the way you experience life. 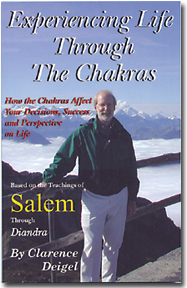 “There are many books out there that talk about the chakras and about healing through the chakras. Experiencing Life Through The Chakras is geared to the spiritual aspect of chakra energy and what this means to each of us on a day-to-day basis. Copyright © 2006-2019 Clarmar LLC. All rights reserved.